California is home to the industrial giants of Silicon Valley, the film industry, and the largest agricultural sector in the nation, but it has starved its public schools of resources for years. After years of working without a contract, the United Teachers of Los Angeles (UTLA) have decided to go on strike, shutting down the nation’s second-largest school district. The union’s demands go well beyond better salaries and benefits, and include a call for lower class sizes (LA has some of the highest per-pupil class sizes in the nation), more counselors, nurses, and, most importantly, a moratorium on the authorization of charter schools (LA has more charter schools than any city in the nation). UTLA President Alex Caputo-Pearl has characterized the dispute with the district as a fight for the future of public education. Though UTLA undoubtedly has drawn inspiration from the teacher strikes that occurred last year in Oklahoma, Arizona, and West Virginia, this strike will occur in the bluest state in the nation, California, and one of the most liberal cities. The difference is important. On issues such as climate change, immigration, and health care, California has not only been leading the opposition to the Trump administration, it has also embarked upon a new direction in public policy which could eventually serve as a guide for a future Democratic administration in Washington. However, on matters related to education, California is a laggard rather than a leader. Outgoing Governor Jerry Brown attempted to bring some relief to the state’s under-funded schools. Under his leadership the state adopted a ground-breaking funding policy, the Local Control Funding Formula (LCFF), which has brought additional revenue to schools serving students with the greatest needs. However, when cost of living is figured into education expenditures, California continues to rank near the bottom of the fifty states on spending for education. Despite the fact that California has the world’s fifth largest economy and is home to the industrial giants of Silicon Valley (e.g. Google, Apple, Twitter, etc. ), the film industry, and the largest agricultural sector in the nation, it has starved its schools of resources for years. The state also has the largest prison population and the largest number of people living in poverty. For many years, extreme inequality in income and wealth has made the California Dream a total illusion. Inequality is particularly glaring in Los Angeles, especially in its schools. The Los Angeles Unified School District (LAUSD), serves many unaccompanied minors and children in foster care. In a district where the overwhelming majority of children are poor, many of the schools lack the resources to address basic social needs. In this context, UTLA’s demands have resonated with the public. 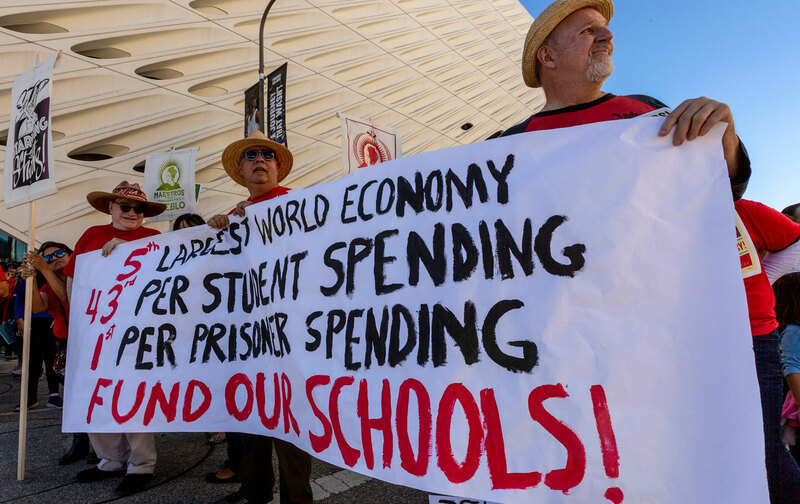 However, despite the UTLA’s contention that the district has the funds to meet their demands, over the past few years several reports have warned that LAUSD is faced with a significant structural deficit. The district is spending approximately half a billion dollars more each year than it takes in. Without corrective action, the deterioration of the financial situation will worsen over the next few years. The deficit is caused in part by rising pension and special education costs, and lost student enrollment due to the expansion of charter schools and demographic change. There are no quick or easy fixes for these problems. In 2015, then-Superintendent Ray Cortines assembled a blue-ribbon committee to provide an objective analysis of the district’s finances and to make recommendations for how projected deficits should be addressed. According to the report: “The expanding gap represents a serious challenge to the LAUSD’s financial stability in the near term, one that insists upon immediate action today.” The report concludes that “if the District desires to continue… beyond FY 2019-20, to be capable of improving the lives of students and their families, then a combination of difficult, substantial and immediate decisions will be required. Failure to do so could lead to the insolvency of the LAUSD, and the loss of local governance authority that comes from state takeover.” Similar warnings have been issued by the LA County Office of Education, and the state department of education. In the fall of 2015, I was invited to facilitate a retreat with the LAUSD School Board on the fiscal challenges facing the district and the various options available for addressing it. For two full days, board members discussed the growing deficit, and the implications for the district’s future. I advised the school board that the district needed a strategic plan that would make it possible to reduce operating costs over time, identify possibilities for generating new revenue through a parcel tax or bond measure, and significantly increase the number of “good schools” capable of attracting families in Los Angeles while decreasing the number of poor-performing, under-enrolled schools. None of this would be easy and, not surprisingly, no plan was developed. Regardless of whether or not UTLA goes on strike, these challenges will remain. So far, Mayor Eric Garcetti has largely been silent, despite the fact that LAUSD is also the city’s largest employer, and he has announced plans that he is considering a run for President. Garcetti and others with power and influence have demonstrated more concern about the 2028 Olympics than they have for the schools serving the majority of the city’s children. The UTLA is right; the future of public education in LA is indeed in jeopardy. However, the strike won’t solve the financial problems facing the district. That challenge will have to be taken up by the new governor, Gavin Newsom, who has already made more promises than he can possibly deliver on. Teachers are rising up to demand reinvestment in public education. Let’s hope that the politicians who they have supported rise to the challenge with them.